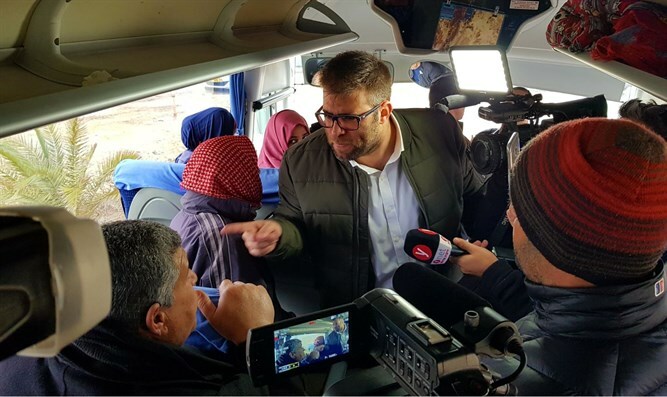 Likud MK Oren Hazan joins protest blocking buses of visitors from reaching convicted and imprisoned terrorists. The Task Force for the Release of Prisoners and Missing Persons on Monday morning blocked two buses from the Gaza Strip to Nafha Prison near Mitzpe Ramon, demanding equality for Israeli prisoners held in Gaza. Passengers on the buses included including women from Gaza, Judea, and Samaria, wishing to visit their sons, who are convicted terrorists. MK Oren Hazan (Likud), who accompanied the activists, confronted the families of terrorists. "As I promised, I approached without fear the Hamas bus, which came to visit the scum they call family," Hazan said. "In the stormy meeting, I told them that a terrorist's place is underground. And no, I did not mean tunnels." On Sunday, senior Task Force member Yoel Marshak told Arutz Sheva, "We get on the bus and explain to them in Arabic the need for reciprocity. It is inconceivable that they can visit their sons and the families of our missing people do not know what their situation is." "Naturally, they are angry at the delay and tell us they have no connection with Hamas, but we hope they will send the message to Hamas." Referring to the Israelis held by Hamas, Marshak concluded, "It is inconceivable that they can visit the terrorists in our prison, and the families of [Oron] Shaul, [Hadar] Goldin and [Averu] Mengistu cannot." "According to the Geneva Convention, we do not have to allow them to visit their sons. The Red Cross visits them and that is enough. We demand that they stop these visits as long as they do not allow us to visit our captives." The Red Cross has in the past urged Hamas to comply with its obligations under international humanitarian law and provide an update on the condition of Israeli nationals who went missing in Gaza. However, Hamas has refused to provide information or allow the Red Cross to visit the missing Israelis.